The Olive Branch offensive was launched by Ankara on January 20 in the Kurdish-dominated Syrian town of Afrin, controlled by the US-backed Kurdish People's Protection Units (YPG). The Turkish Army has eliminated 394 Kurdish and Daesh fighters, while the country's aviation has destroyed 340 targets, the Turkish General Staff reported Saturday. "Since the beginning of the Olive Branch operation, the Turkish Air Force has destroyed 340 targets, belonging to the PYD, the YPG and Daesh, while 394 fighters have been eliminated. At the same time, three Turkish soldiers have been killed and 30 wounded. Thirteen fighters from the Free Syrian Army have been killed and 24 wounded," a statement, obtained by RIA Novosti news agency says, noting that the operation had been proceeding on a scheduled basis. The statement by the Turkish General Staff comes a day after the Syrian Democratic Forces' press service reported the deaths of 308 Turkish servicemen in the Olive Branch operation in Afrin. At the same time, Turkish President Recep Tayyip Erdogan has claimed that Ankara could extend its third military advance in Syria all the way east to the border with Iraq, emphasizing that the country would "completely clear the region of terrorists, beginning with Manbij and throughout our entire border [with Syria]." 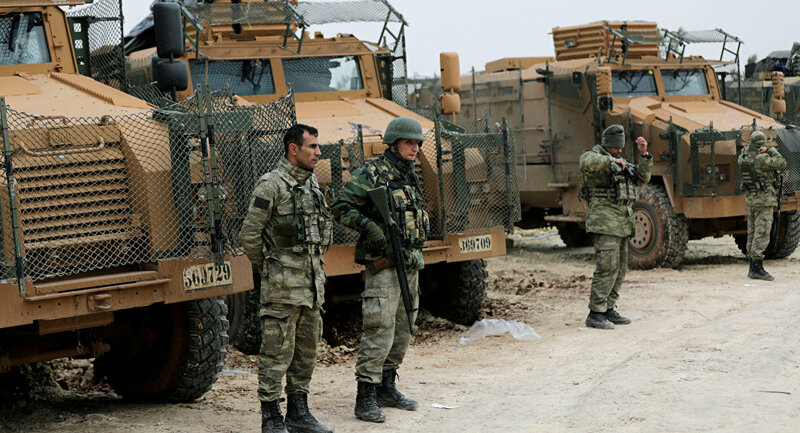 Turkey has been conducting the Olive Branch military operation in the Kurdish-dominated Syrian town of Afrin since January 20. The town is controlled by the US-backed Kurdish People's Protection Units (YPG). The latter is considered to be affiliated with the Kurdistan Workers' Party (PKK), which is designated as a terrorist group by Turkey and several other countries. Despite opposition to the operation by many members of the international community, Ankara has stressed that the advance is not aimed against the Syrian government, calling the territorial integrity of Syria its mutual goal with Damascus. Damascus has, however, denounced the operation as a violation of Syria's sovereignty. For its part, Russia has called upon all parties involved to exercise restraint and respect Syria’s territorial integrity.